An author's voice is what separates the exceptional writer from the rest. Cultivating that uniqueness is almost never a solitary endeavor. 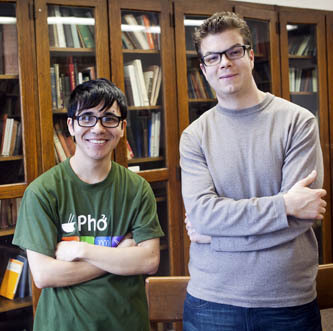 Poets Ocean Vuong (left) and Ben Lerner at the Costas Library. An author's voice is as unique as his or her DNA, a thing that separates the exceptional writer from the rest. Cultivating that uniqueness is something that for Ocean Vuong '12, and many talented young writers, was not a solitary endeavor. Vuong, who, shortly after graduating, received the 2012 Stanley Kunitz Memorial Prize for Younger Poets from The American Poetry Review for his poem "Prayer for the Newly Damned," and more recently the 2013 Pushcart Prize, credits Professor Ben Lerner of the Brooklyn College Department of English as a pivotal influence on his developing his voice. "I knew I wanted to be a poet and knew about Ben's work," Vuong said in a recent interview, referring to Lerner, whose Leaving the Atocha Station (Coffee House Press) earned him the seventh annual Believer Book Award for the best novel of 2012. The book was also the 2013 runner-up for the Sami Rohr Prize for Jewish Literature Choice award, given by the Jewish Book Council, and is on the short list for the James Tait Black prize, the United Kingdom's oldest literary book prize awarded by the University of Edinburgh. In April, Lerner received a 2013 Guggenheim Fellowship to work on his next novel. To be sure, Vuong, a Vietnam-born American raised in Hartford, Conn., had started writing poetry at Manchester Community College, where he became the first in his family to go on to higher education. After trying Pace University and finally arriving in Brooklyn College in 2008, Vuong's connection to Lerner began when he found out that there was an opening in one of Lerner's undergraduate classes. While he didn't know exactly what to expect when he signed up, he had researched Lerner and his poetry. "Each of Ben's classes was like a new epiphany that pushed me to be a better reader than I was and to rethink everything I was doing," Vuong explained. "The writers we discussed in class were valuable and informed my work." Lerner shattered his idea of what a poet is and can be, he admitted. "Once in a while you get a student who's not testing to be a writer, but who is already one," Lerner said of the former business school student who before starting at Brooklyn College had aspired to be part of the corporate world. "And I could sense Ocean was already a writer." As such, he wasn't "eager to be celebrated but to be challenged," Lerner added, pointing out that he eventually became Vuong's thesis advisor. In a strange sort of way, Vuong said, attending Lerner's class gave him a new set of eyes and gave him permission to be anything he wanted to be and to dare to write differently. Choosing Lerner meant that the work would become increasingly difficult, at least at first, but the challenges only spurred Vuong to work harder. "Mentoring – I learned from my own mentors and role models – is to know when to apply pressure to the person you take under your wing," Lerner added, "but without trying to turn him into someone like you. It involves respect." "Ben is someone who examines what you are trying to do as an artist and then helps you to better achieve that goal, all while challenging you outside of your comfort zones," said Vuong. "I don't think a student of poetics could ask for a better learning environment."